Art Pottery Vase With Large Brown stamp with letters, a plus (+) symbol in a circle and shaped rectangles with nodes - Chinese? Art Pottery Vase With Large Brown stamp with letters, a plus (+) symbol in a circle and shaped squares with node corners - Chinese? Art Pottery Vase With Large Brown stamp - Chinese? 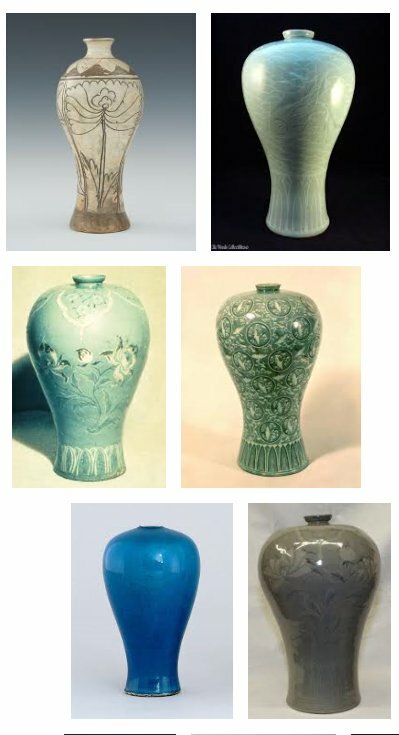 As I read online once "I have the pottery gene", I laughed because that is me in a nutshell. I gravitate towards ceramics, stoneware and pottery and have some nice little collections from my treasure hunting. 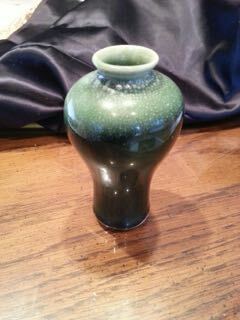 I found this small 4" vase at a thrift store, I liked it because of the graduated green turning almost to black at the bottom and that it's quite heavy for a piece of this size. I collect ceramics of all kinds, not always the high end stuff although I have 4 Crown Devon Art Deco tubelined vases that are my joy. I also have a beautiful Royal Bonn Art Nouveau portrait vase that gives me shivers. The rest are pieces that range in value from $10 to $150. I started "thrifting" when I became a mom 8 years ago, the thrift store was cheap entertainment for me and the baby to buy books, toys for her and trinkets for me. I found a beautiful old Redwing crock one day, I didn't know what it was and never had seen one but fell in love...it was $19 which was more than I usually paid for a whole day at the thrift store but I had to have it. I researched and found what it was and then started my obsession. I found myself anxious to get to the dishes and trinket section in the thrift store and started seeking out all the thrift stores in my area. Then I found a small 5" figural fish vase that was rustic and unique, I took it to an antique store and was told it is majolica (which I had never heard of) and worth about $80 (no markings), I still absolutely adore it and am so happy I paid the $8.99 for it haha! Now I am doomed, 5 years ago we needed a new set of dishes and I could not get past the cheap pottery, even at Macy's, but then in another department there, they had higher priced tableware..there I discovered DENBY! The weight of the plates, the sound they make when you tap on them, I was honing in on that "pottery gene" that had been developing. I noticed this was better than all of the beautifully decorated plates and bowls in the other department that clinked and clanked in a hollow way and felt light and empty, I also remembered a recent dinner at a friend's house where the plates were lovely but contained many chips, I thought aha, THOSE are the ones that chip easy, they must not be so good. So Denby it was and oh boy, I am in love! I literally (accidentally) dropped a bowl on our hardwood floor and no chip, no break, we have heavily used and run them through the dishwasher for 5 years and they still look as beautiful as the day they were bought! It was worth the money and I am so grateful I had the ability to see the difference at that time. 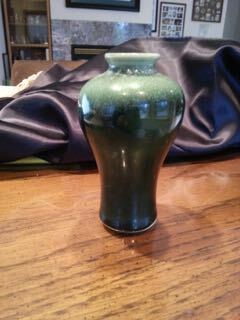 I enjoy learning all there is to know about each piece I obtain and this little green vase has put me to work! 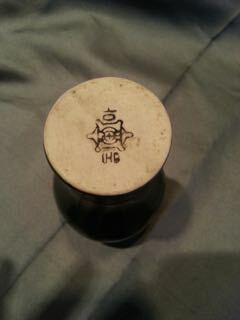 Now I am at a total loss and need some help identifying the makers stamp if it's possible. I appreciate any input and help from others experience. Thank you for reading my story, it was fun to write about the coming of my love for ceramics, pottery and stoneware. I still consider myself a novice and look forward to more education and learning in this field. This was was a good experience to write. Comments for Art Pottery Vase With Large Brown stamp with letters, a plus (+) symbol in a circle and shaped rectangles with nodes - Chinese? It was also a good experience to read! Thanks for sharing and reaching out. This one is totally obscure and also impossible to describe in a search. 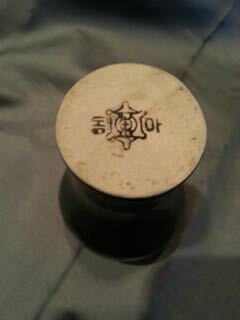 Can anyone else who can read Korean confirm this is Korean hanja?